my craftroom is my safe and happy sanctuary. 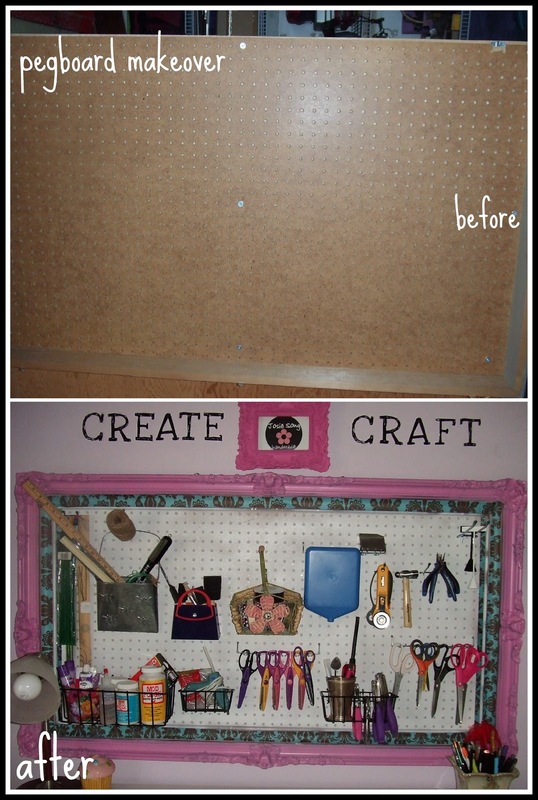 i recently took an old pegboard from our garage and an old garage sale frame and made this fabulous new addition to my craft station! This pegboard sits directly above my craft table and houses tools for papermaking, jewelry making, and any other craft phase I am going through at the moment. I love the easy access to punches, scissors, glues, brushes, etc. I think the best thing about it is the fact that I have gained so much more desk space. The spraypaint color is Rust-Oleum Orchid. The aqua and brown trim is from Joann's (it's the stuff that is used to make re-usable grocery bags). Love your pegboard! I did the same thing, only yours is much bigger than mine. 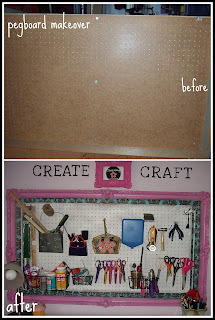 I think I have PE, pegboard envy! Ha ha! But seriously, I love how versatile pegboard is, you can configure it and change it as your needs change or as you "fine tune" your storage needs. You did a great job on yours!